Updating your kitchen? Why not have Tatro’s Concrete Impressions install a custom concrete counter top? Make your outdoor kitchen a thing of beauty with a custom concrete grill and counter top. Tatro’s Concrete Impressions will work with you to create a custom patio for your home. Call us to receive a free quote. 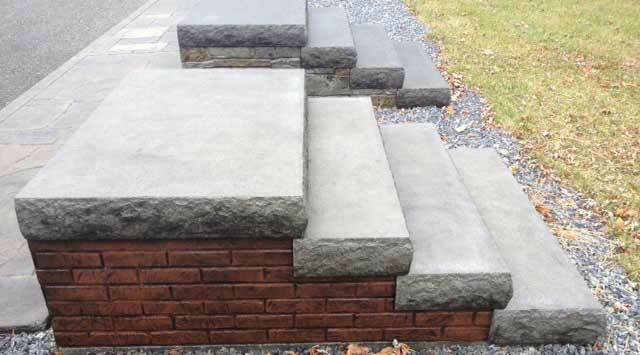 Tatro’s Concrete Impressions offers several types of concrete steps that can match your home or office. Besides the different types of patterns we offer for precast concrete steps we also offer a variety of colors to choose from. Railings can easily be attached to one or both sides of the precast concrete steps. The versatility of stamped concrete can extend to both exterior and interior decoration. Stamped concrete can complement both old world and contemporary style. Completed stamped concrete projects are solid surfaces which do not permit growth of grass or weeds. Stamped concrete is strong, durable and requires low maintenance. With proper care and attention using our services, stamped concrete can be enjoyed for up to fifty years. Friends and family – It’s time to gather round our custom fire pits made to look like river rock or dry stack slate stone and roast some marshmallows. Our fire pits are able to have a 3 foot to 5 foot diameter and can be lit with wither wood or even propane. Our fire pits will make your backyard the quintessential gathering place for the best ghost stories and ooey gooey s’mores.